SUBHEAD: Berkeley official requests Health Department inform public of elevated risks from Fukushima contamination. 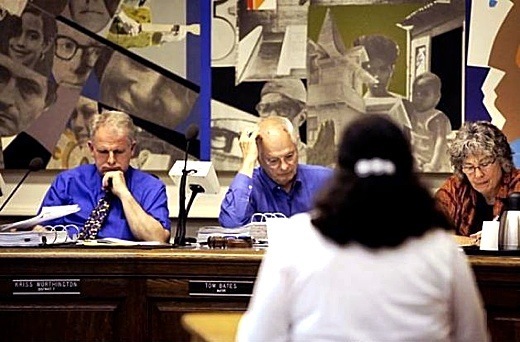 Image above: Kriss Wothington (left) sits at Berkeley California City Council meeting in 2009 listening to testimony. From (http://www.sfgate.com/bayarea/article/Berkeley-City-Council-meetings-too-long-3242713.php). [IB Publisher's note: Berkeley California City Council member Kriss Worthington has offered a resolution to be voted on17 Decmeber 2013. Adopt a Resolution urging the United Nations to form an International Independent Commission of Experts (IICE) to formulate a plan to reduce the radiation being released from the crippled Fukushima Daiichi Nuclear Power Plant, and instructing the City’s Health Department to research and inform the public regarding elevated risk from seafood and other Pacific basin products, and to educate the population of Berkeley regarding specific treatments for radiation exposure and have in place emergency procedures to administer treatment, if necessary, to mitigate radiation exposure. Copies of the resolution to be sent to the U.N. General Assembly, U.N. Secretary-General Ban Ki-moon, U.S. Ambassador to bthe U.N. Samantha Power President Barack Obama Senator Dianne Feinstein, Senator Barbara Boxer, Congresswoman and Representative to the 68th Session of the U.N. General Assembly Barbara Lee, and Governor Jerry Brown. The March 11 2011 Tōhoku earthquake and tsunami crippled the Fukushima Daiichi Nuclear Power Plant. The meltdown of three of its reactors led to the release of large amounts of radiation. Nearly three years after the disaster, radiation continues to be released from the plant. Storage tanks holding contaminated water have major leaks, releasing up to 300 tons of radioactive water a day. The Bay Area is situated directly east of Fukushima, causing radiation from the disaster to be detected in the region. The radiation has raised concerns over contaminated food, whether it is fish in the ocean or food grown in the soil. The biodiversity of the Pacific Ocean is at risk if radiation continues to be released at its current alarming rate. be presented to the City Council. In it, they urge that the United Nations create acommission that focuses on finding ways to reducing radiation being released from Fukushima Daiichi. Finding a long term solution to end the leakage of radiation is needed to protect the environment and health. I did correspond with the Disaster Preparedness Office, locally, about any preventative measures — and the response was a resounding nothing. In the meantime, no one is monitoring radiation levels on the West Coast, and that is called for in this resolution. Government is not doing its job.